Home > Drawing Supplies | Art Mannequins, Skeletons & Other Drawing Models | Art Skeletons | RICHESON Skeleton MEDIUM SIZE 33-1/2"
RICHESON Skeleton MEDIUM SIZE 33-1/2"
The medium size 33-1/2” skeleton gives artists the perfect model for drawing, teachers an anatomically correct educational aid, and great Halloween decoration! The medium size 33-1/2” plastic skeleton is a remarkable tool for different types of instruction and art. This inexpensive model suits artists learning or perfecting still life sketching skills. For drawing sketches of hands, skull, and other bone structures, the medium size skeleton is a better option economically, compared to expensive life-sized models. The stand included with the skeleton allows viewing from all angles. The medium 33-1/2” human skeleton is not only perfect in the artist’s studio but also classrooms for instruction. Made with durable cast resin and strong metal hinges, this visual tool offers long-term use. 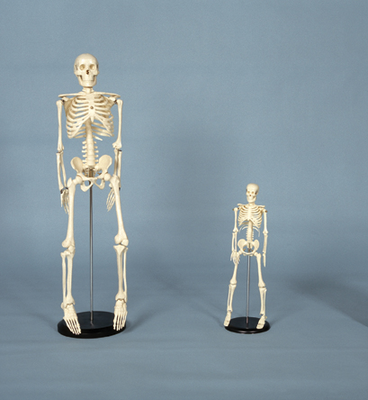 When not functioning as a model, the skeleton medium size makes a festive prop for Halloween and unique decoration at the office. The 33-1/2” size is a terrific model for artists, teachers, and other professionals.